Professional racing and automotive videos. By professional racers. From karts and Hummer limos, to Formula One and Indy cars, Gordon Motorsports makes life easier for your production company when your client wants fast cars. When your racing team needs a promotional SpeedReel, HeroReel, or electronic press kit. Or when your car or motorcycle club wants to produce or promote a charity run or other fund-raising event. With over 35 years of motorsports and production experience, we understand how to create a production that’s both authentic and on budget. We should. Virtually every GMS employee is a racer or a rider. We know what to look for and shoot. And we know how to do our jobs without slowing down yours. We’re responsible, respectful, positive, and when necessary, discreet. Gordon Motorsports is the go-to source for the most demanding production managers and art directors. 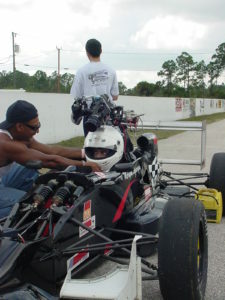 Whether you need precision drivers, location scouting, or a particular type of racecar, we deliver every time. In fact, we often over-deliver. We help your team find and prevent unexpected glitches that can ruin your shoot. A production manager once called us with an interesting request. He wanted to pair an Indianapolis 500 and Formula One winning driver with what he called a Renault Le Car. 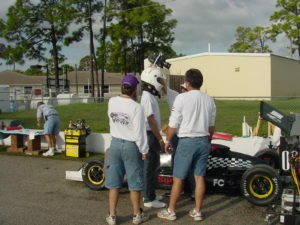 But after a little conversation we realized what he really wanted was not a 55 horse power mini-car, but a 750 horse power Reynard Indy car. We delivered one across country to his location, painted with the client’s graphics, along with matching crew uniforms. What’s more, we did the whole job in five days.